Background: Oral squamous cell carcinoma (OSCC) is the leading cancer among males in India. It is related to tobacco habits and alcohol consumption as well as the individual susceptibility for xenobiotic metabolizing enzyme polymorphisms. 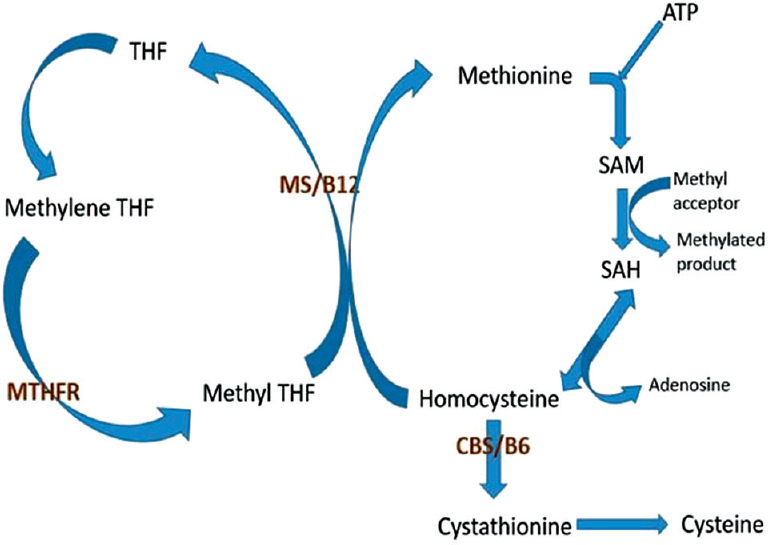 Glutathione S-transferase θ 1 (GSTT1) is a Phase II metabolic enzyme which is directly involved in catalyzing chemicals to mutagenic intermediates. This gene is characterized by genetic polymorphism resulting in complete gene deletion and subsequent absence of the enzyme, which ultimately dictates the risk of cancer development. Scraping buccal mucosa to obtain DNA from the cells is a simple, readily acceptable and rapid method to detect and assess the gene. Aim: To assess GSTT1 gene deletion in individuals giving a history of tobacco smoking and/or chewing and alcohol consumption and absence of clinically detectable lesions; and in OSCC cases to gauge if GSTT1 gene deletion confers protection to an individual and whether it can be used as a "single" marker to arrive at this conclusion. To validate the use of buccal scrape for determining the genotype of an individual by assessing the polymorphism at GSTT1 gene locus (22q11.2). Materials and Methods: Fifty-two cases were evaluated using buccal mucosal scrapes of tobacco habituates for 8 or more years, without clinically evident lesion (Group I) and from mucosa of tobacco habituates with clinically evident and histopathologically confirmed OSCC (Group II). 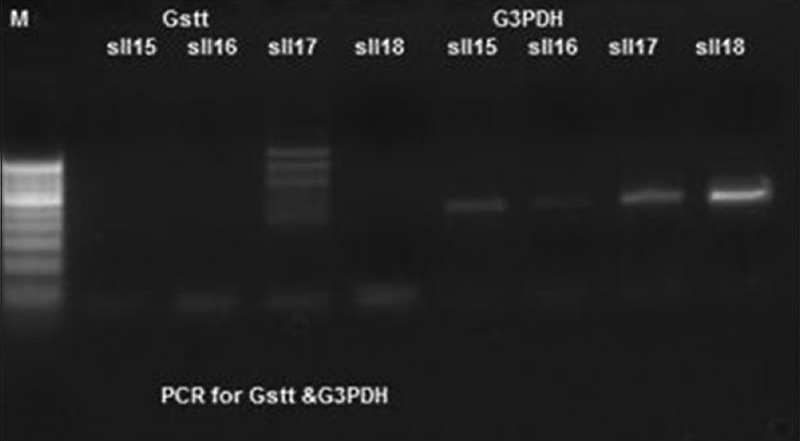 DNA extraction and genotype at GSTT1 gene locus was determined by polymerase chain reaction assay. Statistical Analysis: The results were statistically analyzed using Chi-square test. Results: 90.66% of subjects had GSTT1 null genotype in Group I subjects. In Group II, subjects with both clinically and histopathologically diagnosed oral cancer, about 76.96% had GSTT1 null genotype. Conclusion: GSTT1 null genotype confers protection to individuals with tobacco habits and alcohol consumption, predominantly to those who used chewable form of tobacco and especially among female population. However, the influence of many other environmental, genetic and epigenetic factors should be considered for the genesis/occurrence of cancer. Context: Leukoplakia is classified under the term potentially malignant disorder. This term does not suggest the clinician or the patient about the severity of the disease to undergo a malignant transformation. Thus, there arises a need to identify the risk factors associated with malignant transformation (MT) to predict it at the earliest. Aims: To generate evidence regarding the clinicopathologic factors affecting MT in oral leukoplakias. Materials and Methods: Meta-analysis was done by extracting data from all the previous studies published. Articles were searched in PubMed databases. Statistical Analysis: Mixed model by using the PROC MIXED (SAS 9.3) was performed to estimate the effect of different factors such as gender, type of habit (smoking tobacco, gutka, paan (with tobacco) and no habit association), clinical type and histopathology on MT. The lower specific mean for MT was also calculated with respect to the above-mentioned factors. Results: Speckled leukoplakias also known as erythroleukoplakia confirmed to be at the highest risk. Lateral border of the tongue followed by gingiva, buccal mucosa, floor of the mouth, lesions involving tongue and floor of mouth showed increased risk. Smoking tobacco (cigarette and bidi) and idiopathic leukoplakia (without habit) carried almost equal risk. Gender had minimal influence on MT. Histopathologic correlation of grades showed an insignificant bearing on MT. Conclusion: The carcinogenic transformation of a preexisting lesion (leukoplakia) is multifactorial and patient specific. The protocol to delineate a high-risk lesion should include the clinical type and site. Background: Oral verrucous hyperplasia (OVH) and oral verrucous carcinoma (OVC) are two distinct clinicopathologic verrucous lesions. However, the distinction between the two lesions still remains enigmatic. It is almost impossible to distinguish them clinically. Thus, the final diagnosis rests on the histopathological characteristics of both lesions, being distinguished from each other by an exophytic and endophytic growth pattern, respectively. 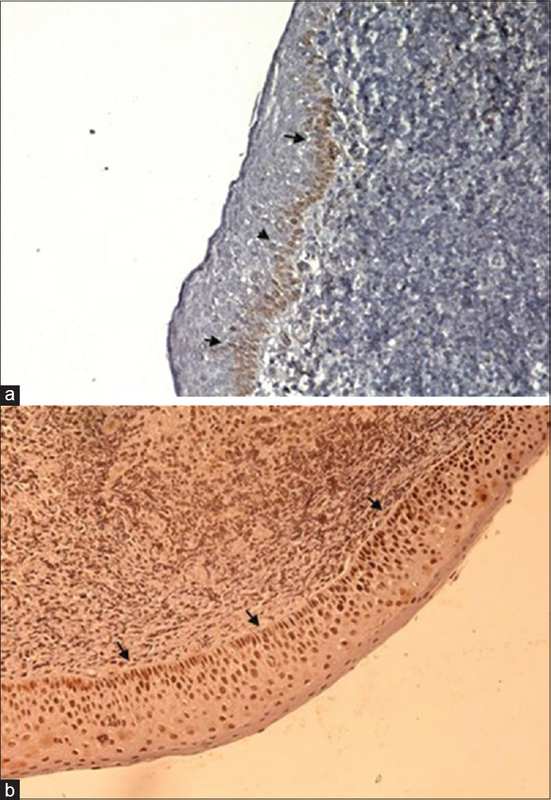 Methods: This institutional study was planned to review retrospectively two series of patients with histologic diagnoses of VH (n = 27) and VC (n = 27) to investigate their clinicopathological features and to analyze the role of immunohistochemical (IHC) marker p53 protein in distinguishing between the two verrucous lesions. The biopsies of the histopathologically diagnosed cases spanning last 10 years were retrieved from the archives of the Oral Pathology department of the institution. Clinical data were tabulated and analyzed for age, gender, site and tobacco habits. IHC staining was done on all the samples using p53 antibody. Results : Applying Chi-square test, the buccal mucosa was the most common affected site and tobacco chewing was more prevalent habit in both these lesions (P > 0.05). While the elderly males (>60 years) were the most commonly affected group in VC, a relatively younger age group of males (30-39 years) was more commonly affected in VH (P < 0.05). IHC staining with p53 antibody did not show any significant difference between these two verrucous lesions (P > 0.05) . 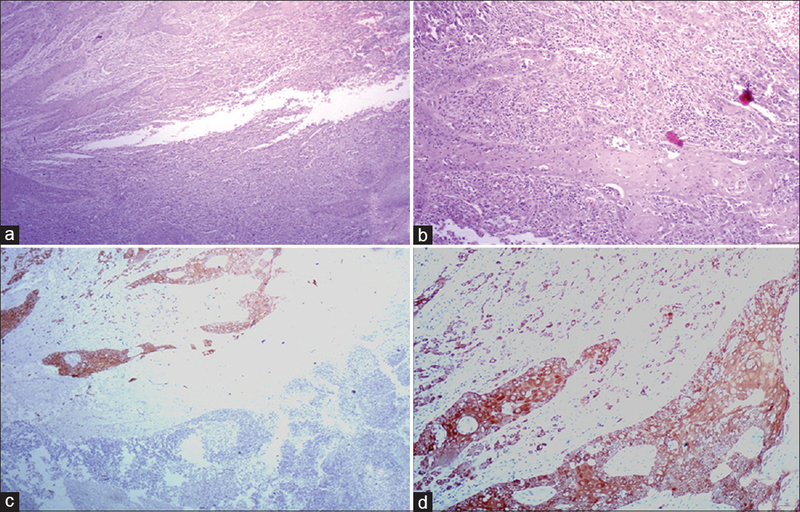 Conclusion: VH and VC are closely related lesions distinguished by an adequate biopsy sample. Background: Origin of adenomatoid odontogenic tumor (AOT) has long been a controversy, and the issue of it being a neoplasm or hamartoma was a subject of debate for a long time. Earlier it was grouped under a mixed group of odontogenic tumors considering the varying degrees of inductive changes. Recently, the WHO classification states that the presence of hard tissue within AOT was not due to induction but was rather a metaplastically produced mineralization and hence the tumor was reclassified under a group of tumors arising from odontogenic epithelium. This study is an attempt to identify if both epithelial (cytokeratin 14 [CK14]) and mesenchymal (vimentin) markers are expressed in the follicular and extrafollicular variants of AOT and to compare the expression with dentigerous cyst (DC) as this cyst is known to arise from reduced enamel epithelium which expressed CK14. This is done to possibly relate the origin of AOT with reduced enamel epithelium. Aims and Objectives: To study, analyze and correlate the expression of CK14 and vimentin in AOT and DC. Materials and Methods: Retrospective study on paraffin embedded tissues. Sixteen cases of AOT and 15 cases of DC were retrieved from the departmental archives and subjected to CK14 and vimentin immunostaining. Statistical Methods: Measures of central tendency was used to analyze the results. Results and Observations: Ninety percent of cases of follicular AOT (FAOT) and 100% cases of extra-follicular AOTs (EAOTs) showed positivity for CK14 and all cases of DC showed positivity for CK14. Vimentin was positive in 44% and negative in 56% cases of both FAOT and EAOT taken together. Conclusion: The CK14 expression profile in AOT and DC supports its odontogenic epithelial specific nature. The possible role of reduced enamel epithelium and dental lamina in histogenesis of AOT and DC is strongly evident by their CK14 expression pattern. Background: Recent studies have revealed the involvement of hedgehog (Hh) signaling component in proliferation and invasive behavior of many carcinomas. Aim: This study aims to identify the expression of sonic Hh (SHH) protein of SHH pathway in oral epithelial dysplasia and oral squamous cell carcinoma (OSCC) using SHH (H-160) (Santa Cruz, sc-9042) which could have therapeutic implication in future. Materials and Methods: A total of 250 cases comprising 50 normal oral mucosa, 50 cases of oral epithelial dysplasia, 50 well, 50 moderate and 50 poorly differentiated OSCCs were included in the study. Immunohistochemical evaluation of SHH protein expression was conducted using monoclonal antibody. Interpretation of the expression was done by immunoreactive score of Remmele and Stegner (IRS) scoring method. Statistical Analysis: Chi-Square test was used to analyze the results. Results: The study showed that SHH signaling molecules are highly expressed in OSCC, and their expression was mainly in the cytoplasm of epithelial cells. Conclusion: The SHH signaling component is associated with the pathological parameter in OSCC and oral epithelial dysplasia. Context: KAI-1/CD82 is a tumor suppressor gene with decreased gene expression being associated with increased invasive ability of oral squamous cell carcinomas (OSCCs). p53 protein functions in the G1-S phase of the cell cycle to allow repair of damaged DNA. In the present study, p53 and KAI-1 expression was investigated using monoclonal antibodies in OSCC. Aims: The aim of this study was to detect KAI-1 and p53 expression in OSCCs and to assess the relation between both in OSCCs. Materials and Methods: The present study included histopathologically diagnosed thirty cases of well- and moderately differentiated OSCCs to study the expression of KAI-1 and p53 antibodies. Statistical Analysis: The results obtained were tabulated and statistically analyzed using descriptive statistical analysis; one-way ANOVA; least square difference method and independent t-test. Results: OSCCs exhibited 41.62% positivity for KAI-1 while p53 positive cells were recorded to an extent of 60.82%. A significant positive correlation was observed between KAI-1 and p53 expression in OSCCs. Conclusions: Although a significant amount of work is still required to uncover the mechanisms of action and regulation of KAI-1 and p53 expression, control of the complex metastatic processes would be of interest in controlling the tumor biology in OSCCs as well as other types of malignancies to enhance prognosis in the affected patients and to help protect against future metastasis in the going to be treated and treated patients. Context: Nonsyndromic cleft lip with or without palate (NSCL ± P) is a genetic predisposition involving defects in shape and makeup of the lip and palate. Elevation of homocysteine (Hcy) levels is seen in medical complications such as developmental anomalies causing neural tube defects, congenital vascular diseases, neurodegenerative and psychiatric conditions. Evaluation of serum Hcy levels forms an important feature to look further into molecular aspects. Aims: The aim of this study was to evaluate the Hcy levels in NSCL ± P cases by comparing with control cases having no orofacial deformities. Settings and Design: This study was performed with a biochemical assay in a research laboratory. Materials and Methods: A cross-sectional prevalence study was done to compare the concentrations of Hcy between 25 NSCL ± P patients and 15 healthy controls. Blood samples were collected from both the patients and controls and assessed for serum Hcy level using competent chemiluminescent immunoassay technique. Statistical Analysis Used: Student's t-test was used for statistical analysis. Results: The average Hcy concentration was 9.5 μmol/L in control group. There was an increase in Hcy concentration among the NSCL ± P cases with an average value of 18.4 μmol/L. The results were found to be statistically significant using Student's t-test. Conclusions: The results of this study indicate that Hcy concentration has a significant elevation in NSCL ± P patients when compared with that of control cases. 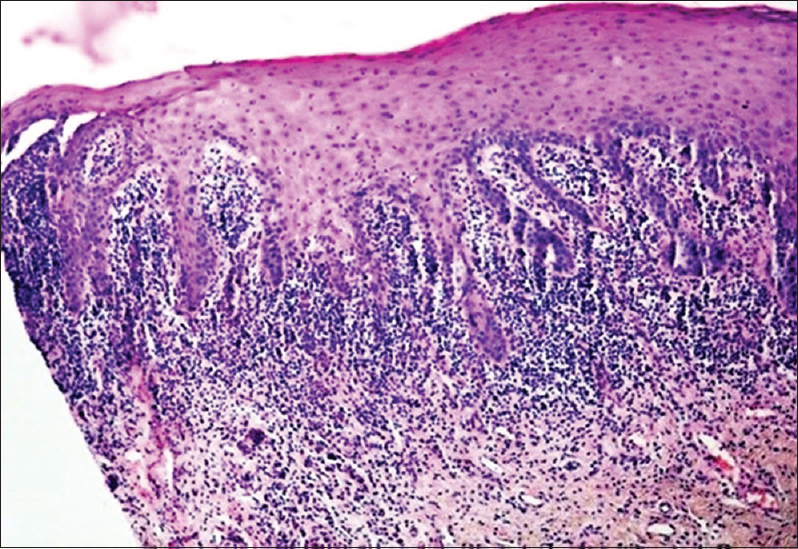 Backgrounds: Lichen planus is a chronic systemic disease and oral mucosa is commonly involved. Oral lichen planus (OLP) most commonly affects middle-aged women. The prevalence of the disease ranges between 0.5% and 2.6% in the general population and the range of malignant transformation varies between 0% and 10%. Objectives: To assess the rate of malignant transformation of OLP samples. Materials and Methods: This retrospective study was carried out on 112 medical records of patients with histological diagnosis of OLP who attended the Department of Pathology at the Educational Hospital from 2005 to 2012. 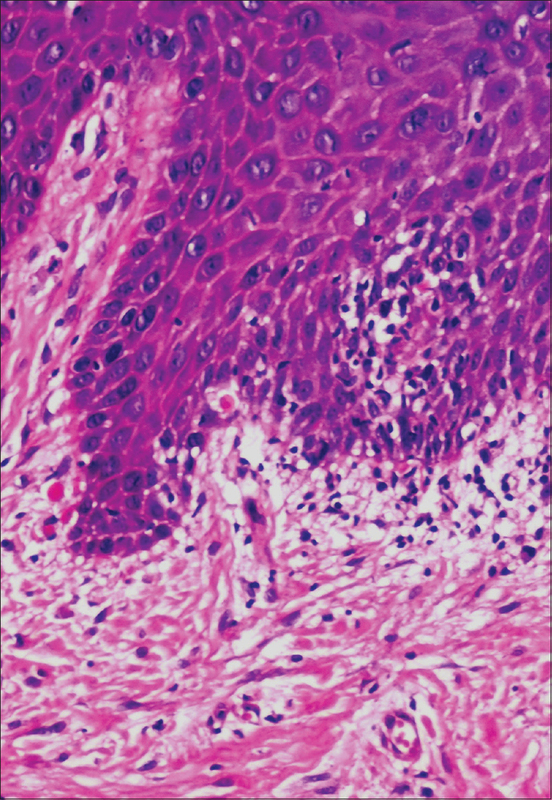 H&E-stained slides were reviewed by two pathologists using strict clinical and histopathological diagnostic World Health Organization (WHO) criteria. Dysplastic changes were diagnosed and graded according to the latest WHO classification. 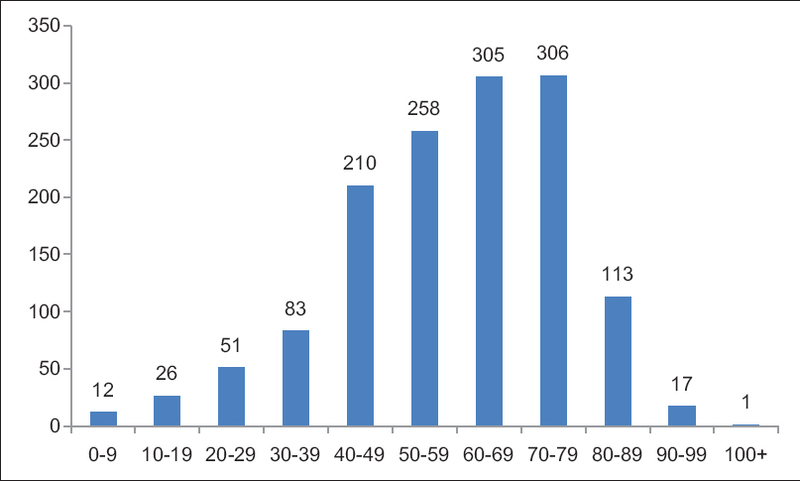 Results: Of the 112 cases diagnosed as OLP, there were 39 males and 73 females and the patients' ages ranged from 15 to 86 years (mean age 44.5 years). The erosive form with fifty cases was the most common clinical type and the papular type with one case was the least common clinical type. Regarding the site, the buccal mucosa was the most common site with 52 cases. Totally, dysplastic changes were found in 12 samples, among them five cases showed mild dysplasia and seven cases showed moderate dysplasia. One case developed oral squamous cell carcinoma after 3 years. Conclusion: OLP is considered as a premalignant condition by the WHO and several authors. Although the malignancy rate is not so high, to reduce morbidity and mortality from cancer arising on OLP lesions, a regular follow-up examination is recommended. Background: Various clinical and histological factors have helped in predicting the survival of patients with oral squamous cell carcinoma (OSCC). However, there has been a need for more specialized diagnostic and prognostic factors to avoid subjective variation among opinion. 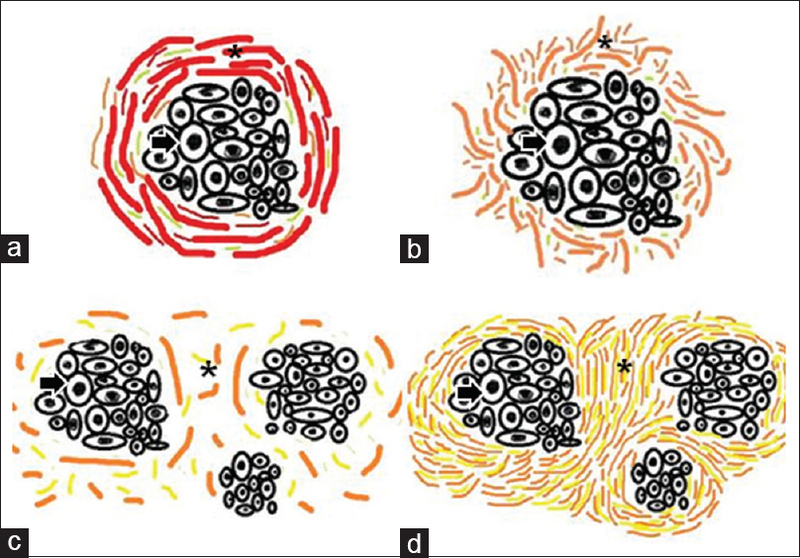 Thus, fractal dimension (FD) can be used as an index of the morphological changes that the epithelial cells undergo during their transformation into neoplastic cell. In oral cancer study, nuclear FD (NFD) can be used as a quantitative index to discriminate between normal, dysplastic and neoplastic oral mucosa. Aim: To use nuclear fractal geometry to compare the morphometric complexity in the normal, epithelial dysplasia and OSCC cases and to verify the difference among the various histological grades of dysplasia and OSCC. It was fulfilled by estimating the FDs of the nuclear surface. 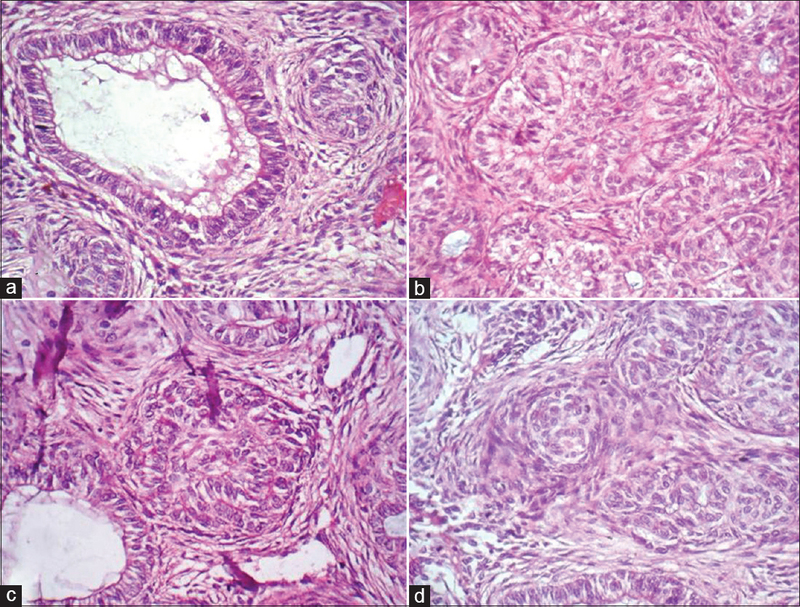 Materials and Methods: Histopathologically diagnosed cases of epithelial dysplasia and OSCC were taken from the archives. Photomicrographs were captured with the help of Lawrence and Mayo research microscope. The images were then subjected to image analysis using the Image J software with FracLac plugin java 1.6 to obtain FDs. FD of ten selected nuclei was calculated using the box-counting algorithm. Statistical Analysis : was done using descriptive analysis, ANOVA and Tukey's honest significant difference post hoc tests with STATAIC-13 software. Results and Conclusion: NFD can provide valuable information to discriminate between normal mucosa, dysplasia and carcinoma objectively without subjective discrimination. Background: Many studies have been carried out to study the role of extracellular matrix proteins, growth factors and matrix metalloproteinases on tumor invasion. 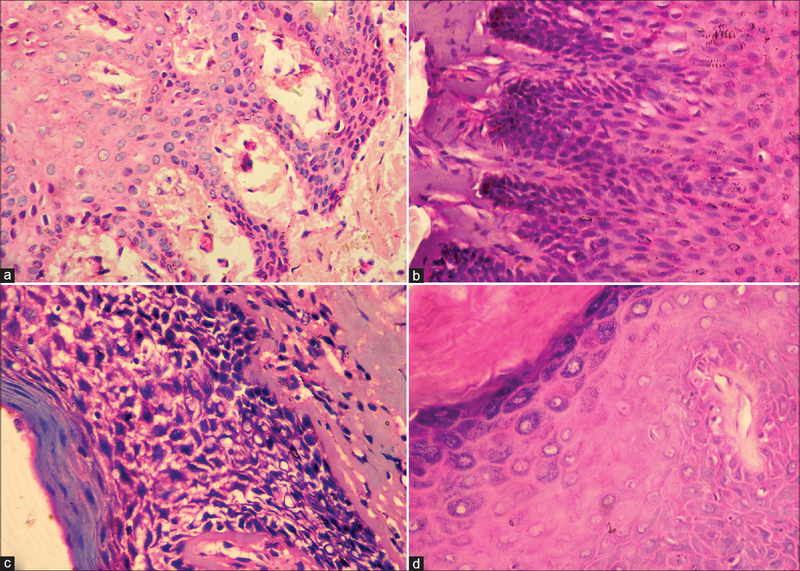 However, literature related to the analysis of connective tissue fibers in varying grades of oral squamous cell carcinoma (OSCC) is very limited. Aim: To analyze the changes in collagen and elastic fibers in varying grades of (OSCC). Settings and Design: This retrospective study was carried out using a light and polarizing microscope. Materials and Methods: Three sections each were cut from fifty samples of varying grades of OSCC and ten samples of control followed by staining with H and E, Picrosirius-Red and Verhoeff-Van Gieson. Qualitative and quantitative analysis of collagen and elastic fibers were accomplished using set criteria. Statistical Analysis: Data were entered into the Statistical Package for Social Sciences (SPSS) version 13.5 for analysis. Results: A change in colors of collagen fibers was seen on progressing from well to poorly differentiated OSCC. Thin collagen fibers predominantly exhibited greenish yellow, but the thick fibers exhibited a variety of colors. As the grade of OSCC progressed, collagen fibers were loosely packed haphazardly arranged. Statistically insignificant results were obtained for quantitative analysis of collagen and qualitative analysis of elastic fibers. Conclusion: The collagen fibers undergo a change in color, orientation and packing in the stroma of varying grades of OSCC. The uniqueness of this study lies in the exploration of elastic fibers in OSCC which has not been done so far. Introduction: Periodontal diseases, if left untreated, can lead to tooth loss and affect at least one tooth in 80% of adults worldwide, with the main cause being a bacterial plaque. Among subgingival plaque bacterial species, Porphyromonas gingivalis has been implicated as a major etiological agent causing tooth loss. Diabetics and smokers are two patient groups at high risk for periodontal disease. The increase in the number of this organism with the coexistence of other pathogenic microbes leads to rapid destruction of the periodontium, premature loss of teeth and also because of its virulence has implications in systemic pathology. Our aim was to observe the involvement of P. gingivalis in diabetes mellitus (DM) patients associated with periodontitis with and without tobacco-associated habits and to compare them with periodontitis patients having no other systemic pathologies. Materials and Methods: Subgingival plaque samples from a total of seventy subjects were included in the study. DNA was isolated from the collected sample and was quantified using spectrophotometer for standardizing the polymerase chain reaction. The quantity of the isolated DNA was checked in a ultraviolet-visible spectrophotomer. Statistics: One-way ANOVA and Tukey's multiple post hoc procedures were carried out. 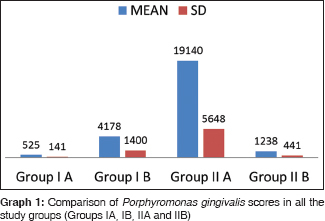 Results: The maximum score of P. gingivalis was seen in periodontitis patients having DM, whereas the least score was seen in periodontitis patients having DM with tobacco smoking habit compared to the other groups. Conclusion: P. gingivalis count is significantly reduced in periodontitis patients having DM with smoking habit; it is concluded that P. gingivalis might not be a key causative organism responsible for the periodontal destruction in case of smokers despite the DM condition. The decrease in counts may be attributed to change in the local environment like chemical (tobacco nitrosamines) and physical changes preventing the growth of P. gingivalis. Introduction: Human immunodeficiency virus (HIV) infection gradually destroys the body's immune system, which makes it harder for the body to fight infections. HIV infection causes a quantitative and qualitative depletion of CD4 lymphocyte count, which increases the risk of opportunistic infections. Thus, CD4 count is one of the key factors in determining both the urgency of highly active antiretroviral therapy (HAART) initiation and the need of prophylaxis for opportunistic infections. Aim: This study aims to evaluate the prevalence and variations in the oral manifestations of HIV/acquired immune deficiency syndrome patients on HAART therapy in urban population and their association with CD4 count. Materials and Methods: A study was conducted by screening eighty patients who were HIV positive in an urban location. Both adult and pediatric patients were screened for oral manifestations and simultaneously CD4 count was also evaluated. Patients with HIV infection for variable time period who are under HAART were considered. Statistical Analysis: Measures of central tendency were used to analyse the data. Results: HIV infection destroys the immune system of an individual, making the patient susceptible to various infections and malignancies. With the advent of antiretroviral therapy, the scenario has changed drastically. We have observed that patients with CD4 counts between 164 and 1286 show relatively few oral manifestations. Long-term HAART therapy causes pigmentation, xerostomia and angular cheilitis but is taken up quite well by the patients. Conclusion: In this study, eighty patients with HAART from urban population showed very minimal oral findings because of good accessibility for treatment and awareness about HIV infections. The patients who were on long-standing HAART treatment also showed minimal oral manifestation such as pigmentation and xerostomia. Hence, we conclude that recognition, significance and treatment of these lesions in patients with HIV infection do not require elaborate setup and can be treated with basic primary health care. Context: Head and neck squamous cell carcinoma (HNSCC) consists of squamous cell carcinomas (SCCs) arising in the upper aerodigestive tract and accounts for 5% of cancers worldwide. In Malaysia, cancers of the nasopharynx, larynx, tongue and oral cavity are among the top twenty most common cancers in men. Argyrophilic nuclear organizer regions (AgNORs) are increased from normal mucosa to premalignant lesions to malignant lesions and have been associated with tumor grade and prognosis of patients. Although p73 is not mutated in human cancers, high levels of p73 expression have been associated with tumor differentiation status and patient prognosis. Aims: To investigate the correlation between AgNORs and p73 immunoexpression. Settings and Design: Fifty-two formalin-fixed, paraffin-embedded HNSCC cases and ten controls were collected from the Hospital. Subjects and Methods: Tissue blocks were sectioned, dewaxed and rehydrated before silver nitrate staining to determine the AgNOR count and immunohistochemical staining to determine the p73 expression. Adopting the scoring system used by Chen et al. for p73 staining, the proportion of positively stained cells in the whole epithelial layer was determined. Staining was considered positive if >10% of epithelial cells were stained. Statistical Analysis Used: Spearman's correlation coefficient was calculated using SPSS 18 software to determine the relationship between the p73 score against tumor differentiation, mean AgNOR counts and tumor grade and between the mean AgNOR count and p73 score. Results: Positive results were found in the immunoexpression of p73. Positive results were seen with the staining of AgNOR; however, in comparison with the entire sample size, a significant correlation between mean AgNOR count and p73 immunohistochemical expression was not obtained. Conclusions: AgNOR count showed a linear and decreasing trend as the p73 score increases. This correlation was statistically insignificant. Introduction: Oral squamous cell carcinoma (OSCC) comprises one of the largest subsets of cancers with a tendency for regional metastasis. Nodal status is a key prognostic indicator in patients with OSCC, particularly with N0 neck. Occult metastasis in the form of micrometastasis (MM) and isolated tumor cells (ITCs), often goes undetected by routine hematoxylin and eosin (H&E) examination using 1-2 sections for analysis. This limitation could be overcome by combining serial sectioning (SS) with immunohistochemistry (IHC) for the detection of MM and ITC. 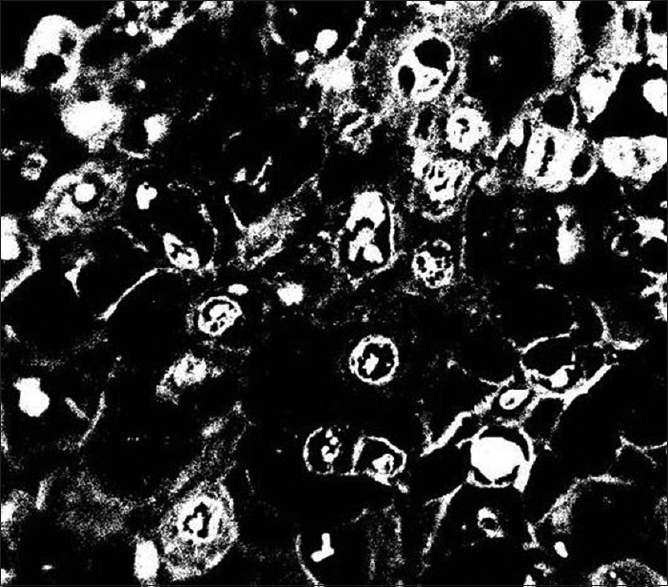 Pan-cytokeratin (pan-CK) (AE1/AE3) is particularly a useful marker to detect these deposits as their presence has resulted in varied interpretations and different applications of the tumor-node-metastasis system. Objectives: The objective of the study was to identify a suitable method for detecting MM and ITC in lymph nodes (LNs) of OSCC by combining SS and IHC and to compare it with conventional H&E staining. Materials and Methods: This laboratory-based, prospective study was conducted on 133 LNs harnessed from ten patients treated with radical neck dissection for primary OSCC. The LNs were subjected to SS at 100 μm intervals. The sections were stained with routine H&E staining, pan-CK and analyzed for MM and ITC according to criteria laid by Hermanek et al. Statistical Analysis: The obtained data were subjected to statistical analysis using Chi-square test. Results: The application of combination of SS and IHC using pan-CK (AE1/AE3) in our study revealed the presence of MM and ITC in 2.25% of the LNs diagnosed as negative on routine H&E examination. The detection of these occult metastatic deposits resulted in upstaging of 33.33% of the patients. Conclusion: In the view of crucial role of occult LN metastasis in prognosis and survival of OSCC patients with N0 neck, diagnostic tools such as IHC staining, particularly with pan-CK (AE1/AE3), combined with SS should be preferred over conventional methods as they result in upstaging, thus sparing the low-risk patients the morbidity of unnecessary treatment. Context: The epithelium atrophy, as the oral submucous fibrosis (OSMF) progresses, is believed to be an after effect of stromal fibrosis, hyalinization, decrease in vascularity and cellularity and is considered as "ischemic atrophy." Due to hypoxia, caspase-3 get activation and subsequent decrease in viable cell count can occur. Aims and Objectives : To determine caspase-3 expression in various grades of OSMF and oral squamous cell carcinoma (OSCC) to find out whether upregulation of apoptosis is responsible for the epithelial changes in OSMF. Subjects and Methods: The control tissue (15 samples from normal oral mucosa) and study group comprising 97 cases of OSMF of different grades and OSCC associated with OSMF were stained with caspase-3 antibody, and the percentage of positive cells was calculated using ImageJ software. Statistical Analysis: The results obtained were statistically analyzed using ANOVA and Tukey's honest significance difference test and Mann-Whitney U-test. Results: There was a nuclear expression of caspase-3 in basal and parabasal layers of normal epithelium. There was cytoplasmic expression of caspase-3 in OSMF without dysplasia, total absence of caspase-3 expression in dysplastic epithelium and in majority cases of OSCC. The caspase-3 percentage was increased in OSMF (0%-53%) when compared with OSCC (0%-8%). The statistical comparison of caspase-3 among normal, OSMF and OSCC patients revealed significant correlation (P < 0.00010). The comparison within different grades of OSMF and between dysplastic and nondysplastic epithelium OSMF also showed significance (P < 0.019). 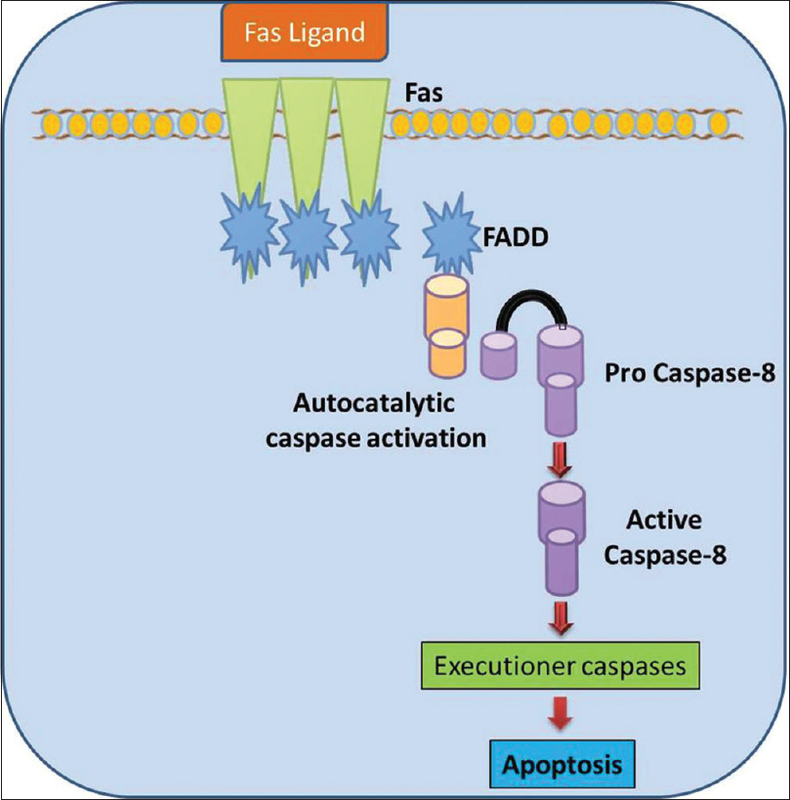 Conclusions: The decreased expression of caspase-3 in disease progression reflects its role in the malignant transformation. Background: Mammalian mismatch repair system is responsible for maintaining genomic stability during repeated duplications, and human MutL homolog 1 (hMLH1) protein constitutes an important part of it. Various isolated studies have reported the altered expression of hMLH1 in oral leukoplakia (OL) and oral squamous cell carcinoma (OSCC). Research is lacking in the quantitative estimation and comparison of hMLH1 expression in OL and OSCC. Aims: To evaluate, quantify and compare hMLH1 immunoexpression in normal oral mucosa, OL and OSCC. Settings and Design: Thirty patients of OL and thirty patients of OSCC formed the study group and thirty patients were included in the control group (normal oral mucosa). Formalin-fixed paraffin wax blocks were prepared from the tissue samples. Materials and Methods: Immunohistochemistry for hMLH1 was performed, and the total number of positive cells was counted in high-power fields, and based on that percentage positivity of hMLH1 was calculated in all the cases. Statistical Analysis: Kruskal-Wallis and t-test were used. P < 0.05 was considered to be statistically significant. Results: The mean hMLH1 value in control group, leukoplakia and OSCC was 78.26, 54.33 and 40.97 respectively. hMLH1 immunoexpression showed decreasing indexes from control group to leukoplakia and then further to OSCC. hMLH1 expression was significantly lower in OSCC as compared to leukoplakia. There was no significant correlation of mean hMLH1 expression between different clinical and histopathological stages of leukoplakia and OSCC. Conclusions: hMLH1 immunoexpression was inversely related to the degree of dysplasia. These findings suggest that there is a progressive decrease in hMLH1 expression from control to leukoplakia and further to OSCC. Thus, it can be concluded that hMLH1 can be used as a reliable biomarker for malignant transformation. Background: Oral malignant tumors in Thailand have not been extensively studied. Hence the following study was conducted. Aims: To determine the prevalence and clinicopathologic data of the oral malignant tumors from Thailand. Subjects and Methods: Biopsy records of the Oral Pathology Department, Chulalongkorn University; Department of Oral Biology and Diagnostic Sciences, Chiang Mai University; Department of Oral Diagnosis, Khon Kaen University and Department of Stomatology, Prince of Songkla University, were reviewed for lesions diagnosed in the category of oral malignant tumors from 2005-2014. Demographic data and site of the lesions were collected. Statistical Analysis Used: Data were analyzed by descriptive statistics using SPSS software version 17.0. Results: Of the 22,639 accessioned cases, 1411 cases (6.23%) were diagnosed as oral malignant tumors. The mean age of the patients was 59.13 ± 17.32 years. A total of 651 cases (46.14%) were diagnosed in males, whereas 759 cases (53.79%) were diagnosed in females. 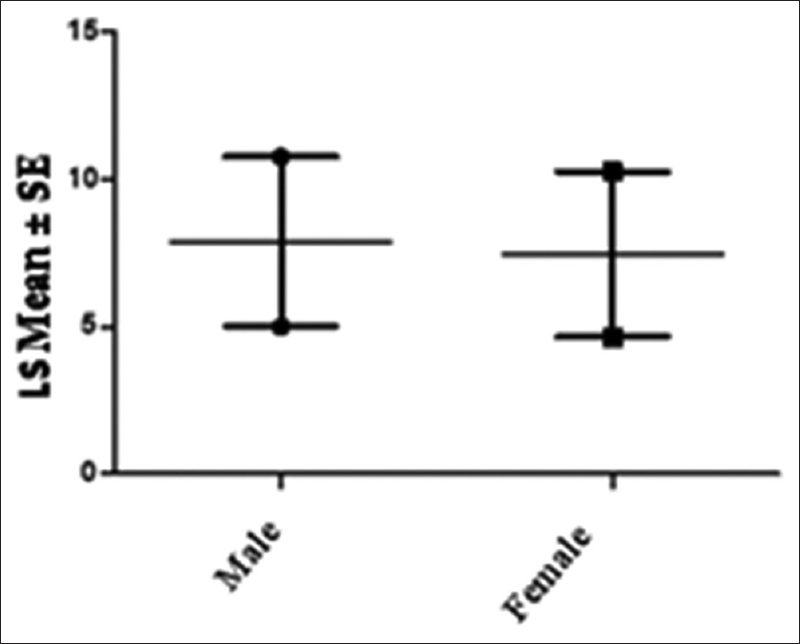 The male-to-female ratio was 0.86:1. The sites of predilection for oral malignant tumors were the gingiva, followed by tongue and alveolar mucosa. The three most common oral malignant tumors in the descending order of frequency were squamous cell carcinoma, non-Hodgkin lymphoma and mucoepidermoid carcinoma. Conclusions: This study provides extensive data on the oral malignant tumors from several university biopsy services located in virtually all parts of Thailand. The data from the present study show some similarities with previous studies; however, differences such as gender and site of predilection still exist. Introduction: Angiogenesis is a complex event mediated by angiogenic factors released from cancer cells and immune cells. It has been reported to be associated with progression, aggressiveness and metastases of various malignant tumors including oral squamous cell carcinoma (OSCC). Similarly, mast cells have also been reported to play a role in tumor progression and metastases by promoting angiogenesis. Objectives: The present study was conducted to compare microvessel density (MVD) and mast cell density (MCD) in different histological grades of OSCC in comparison with normal oral mucosa (NM). Materials and Methods: Comparison of MVD by CD34 and MCD by toluidine blue among different histological grades of OSCC and in NM as controls. Statistical Analysis : The results were analysed using ' t" test, ANOVA and Pearson's correlation co-efficient. Results: The mean MVD was higher in different grades as compared to normal mucosa. Intergroup comparison of increase in MVD between different grades of OSCC was not found to be highly statistically significant. Pearson's correlation between MVD and MCD revealed a linear increase in MVD as the MCD increased, suggestive of a positive correlation. Conclusion: There was significant correlation found between MVD and MCD which was in agreement that mast cells promote tumor progression through upregulation of angiogenesis. Matrix metalloproteinase-9 (MMP-9) is an inducible enzyme. Oral potentially malignant disorders (OPMDs) are considered as the early tissue changes that happen due to various habits such as smoking tobacco, chewing tobacco or stress. This alteration in the tissues alters the expression of MMP-9. The rationale of the review is to know the expression of MMP-9 in OPMDs. 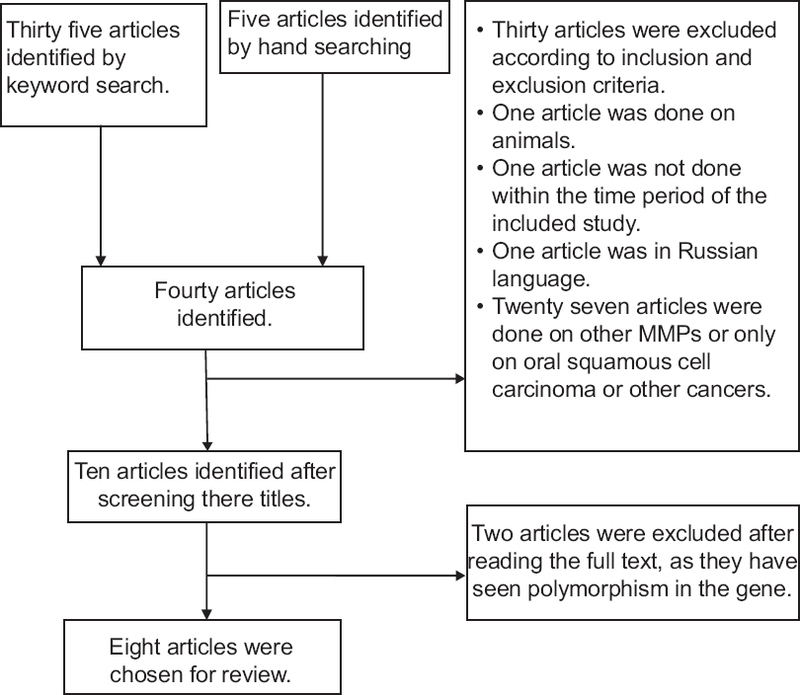 Hand searching and electronic databases such as PubMed and ScienceDirect were done for mesh terms such as OPMDs and MMP-9. Eight articles were obtained, after applying inclusion and exclusion criteria. These articles were assessed with QUADAS and data were extracted and evaluated. The included eight studies were done in 182 oral squamous cell carcinoma cases, 430 OPMDs (146 oral lichen planus, 264 leukoplakia and 20 oral submucous fibrosis) and 352 healthy controls evaluated for MMP-9. MMP-9 expression was found to be elevated in tissue, serum and saliva samples of OPMDs than in healthy controls. There is only one study in each serum and saliva samples to evaluate MMP-9. Saliva being noninvasive and serum being minimally invasive, more studies need to be done in both serum and saliva to establish MMP-9 as an early diagnostic marker in OPMDs to know its potential in malignant transformation. Myoepithelial cells (MECs) are considered to be a key participant in most salivary gland diseases, particularly tumors. 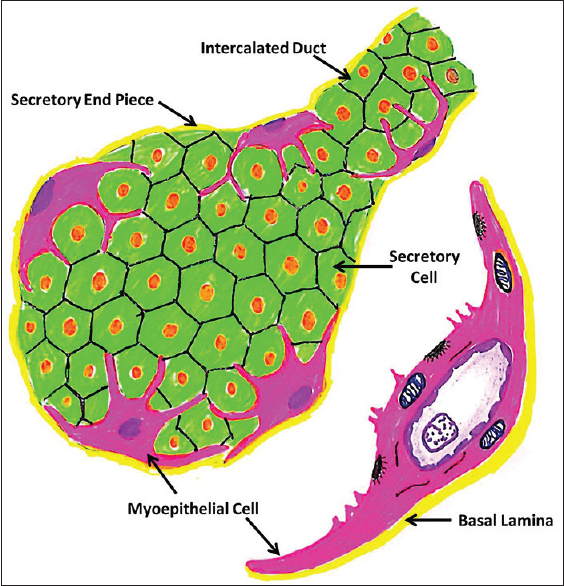 MECs structurally resemble both epithelial cells and smooth muscles. Diagnostic dilemmas caused are due to inadequacy of characterizing the wide spectrum of morphologic and immunologic features which are different for both normal and neoplastic MECs. This article discusses the development, functions and structure of both normal and neoplastic MECs, their staining properties and differences in the morphologic and immunophenotypic properties of the MEC in detail. It also describes the role of MEC in pathogenesis and morphogenesis of various nonneoplastic and neoplastic salivary gland lesions and thereby are responsible for the myriad histopathology of salivary gland tumors. Cell death appears to be a basic biological phenomenon which is maintained by the human body. The term apoptosis, also known as programmed cell death, is characterized by several unique morphological and biochemical features. Apoptosis and its different forms are essential for tissue homeostasis. Alteration in molecular mechanisms involved in apoptotic signaling contributes to a vast range of oral diseases. An understanding of the regulation of apoptosis has led to the development of many therapeutic approaches and better management of oral diseases. The review updates us the correlation between apoptosis in normal oral tissues and oral diseases. Ameloblastoma is the second most common benign epithelial odontogenic tumor and though it is of a benign nature, it is locally invasive, has a high recurrence rate and could potentially become malignant. Many theories have been proposed to explain the pathogenesis of ameloblastoma. Proper understanding of the pathogenic mechanism involved in ameloblastoma and its proliferation aids in constituting proper treatment of choice at an early stage, preventing morbidity associated with extensive therapy. An attempt has been made to discuss the current concepts related to molecular and genetic changes that occur in ameloblastoma as these could affect treatment plan and prognosis. Salivary duct carcinoma (SDC) is a high-grade adenocarcinoma arising from the ductal epithelium of salivary glands which rarely involves the minor salivary glands. 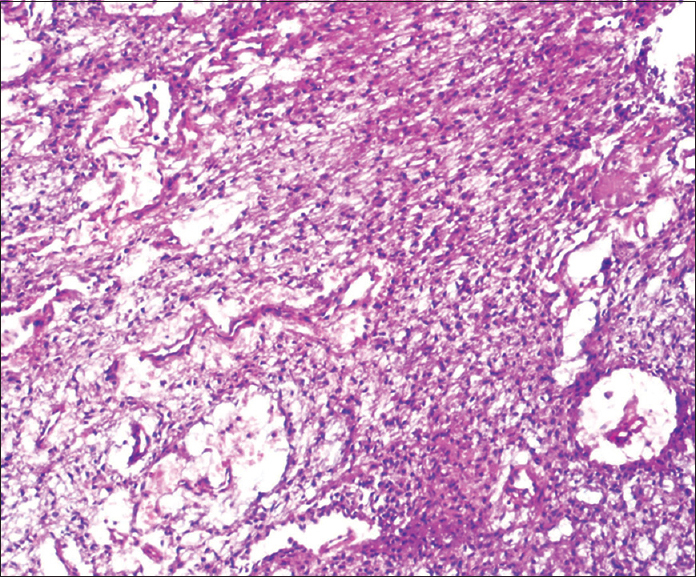 The varied histological presentation in the minor salivary gland tumors makes them the most heterogeneous group of neoplasms, making the diagnosis a challenge. 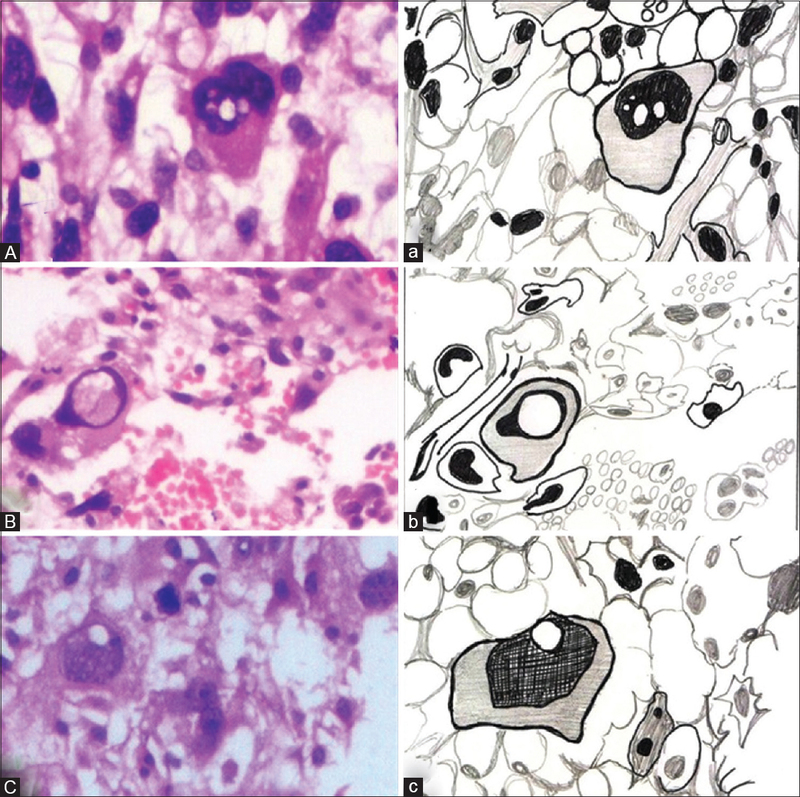 This report highlights the importance of immunohistochemical markers in the definitive diagnosis of SDC. The non-Hodgkin's lymphoma (NHLs) is a diverse group of lymphoid neoplasms, prevalence of which increased since three decades. NHL is diverse in the manner of presentation, response to various treatment and prognosis. NHL usually involves not only lymph nodes but also extranodal sites. Usually, oral manifestation of NHL is secondary to the widespread involvement throughout the body. Oral NHL is relatively rare and difficult to diagnose in clinical setting as it presents as local swelling, pain, discomfort and mimics pyogenic granuloma, periodontal disease, osteomyelitis and other malignancies. 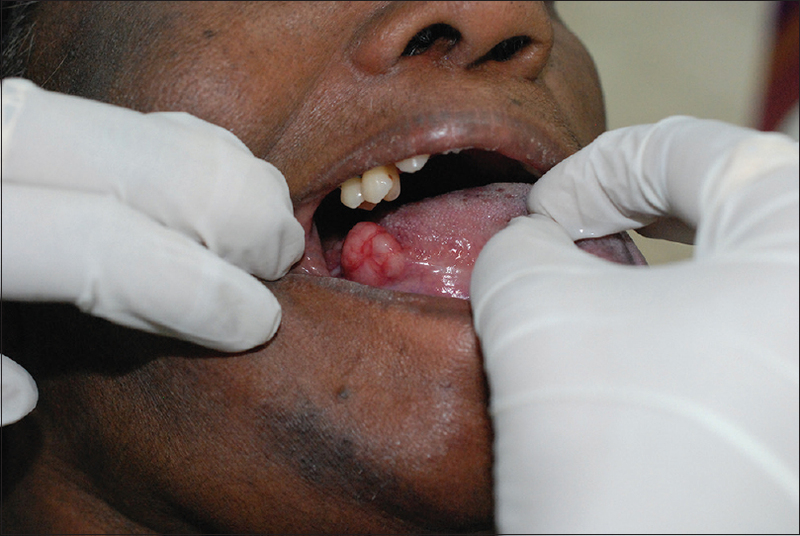 Sometimes, oral lesion may present as the early disease (primary site). Careful evaluation of patient and proper investigations is required for correct diagnosis so that patient will receive the treatment in early stage which has a good prognosis. 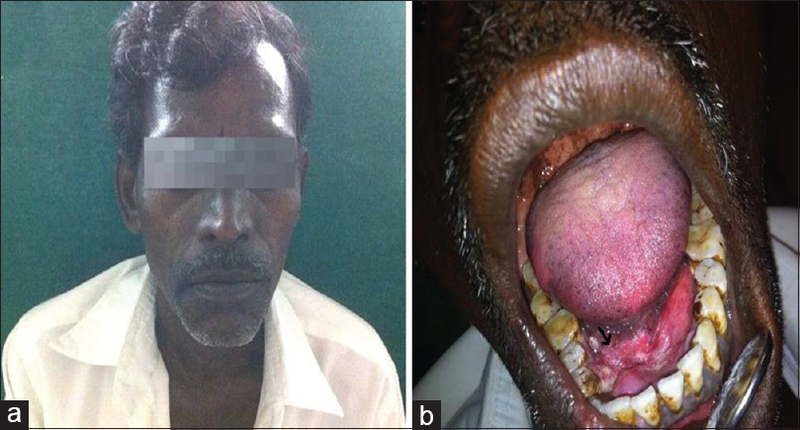 Here, we are presenting the case of low-grade B-cell NHL of palate of a 92-year-old man. Central mucoepidermoid carcinoma (CMC) of the jaw bones is a rare malignant salivary gland tumor of unknown pathogenesis, comprising about 4% of all mucoepidermoid carcinomas (MECs). Most cases are histologically classified as a low-grade tumor and radiographically appear as a well-defined unilocular or multilocular radiolucent lesion. Block resection or wide local excisions are the treatment of choice and patients usually show a good overall prognosis although a long-term follow-up is necessary. 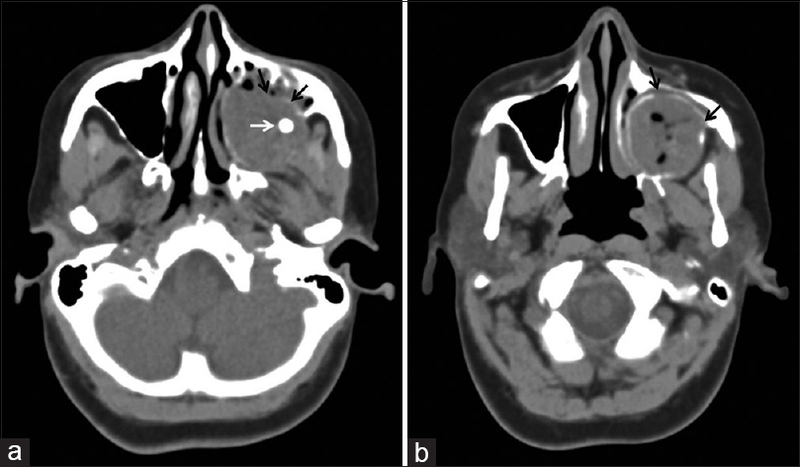 This report describes a case of a 28-year-old male with MEC in the posterior region of the mandible and discusses its clinical, radiographic and histopathological findings. Although rare, CMC may be considered a differential diagnosis in cases of proliferative and osteolytic lesions in the oral cavity even when its clinical and/or radiographic findings do not suggest malignancy. Granulocytic sarcoma (GS) is an extremely rare condition involving infiltration of myeloblasts or immature myeloid cells in an extramedullary site. It is also known as chloroma, myeloid sarcoma or extramedullary myeloid tumor. It usually occurs concomitantly with acute myelogenous leukemia or with the onset of blastic phase of chronic myelogenous leukemia. On rare occasions, it evolves even before the onset of leukemias, and when it precedes leukemias without any overt signs, it is referred to as the primary type. 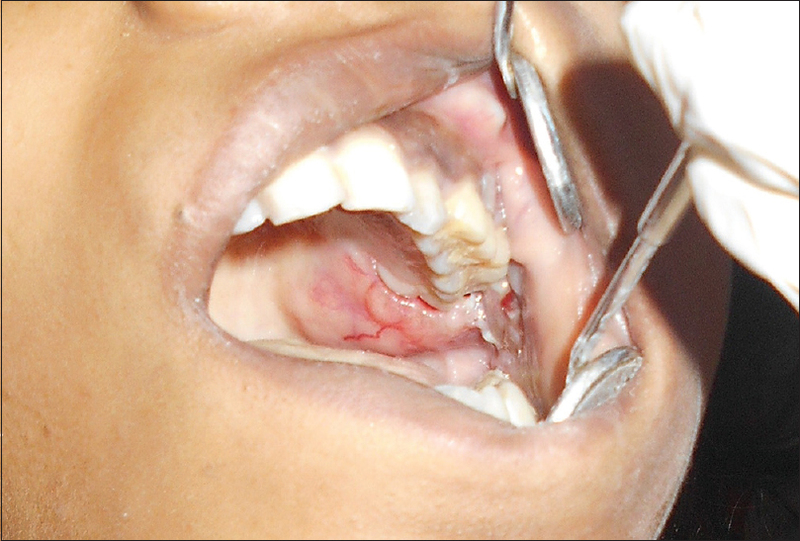 Although GSs can involve any body part, localization in the oral cavity is extremely rare. The recognition of this rare primary entity is important because early aggressive chemotherapy can cause regression of the tumor and improve survival. 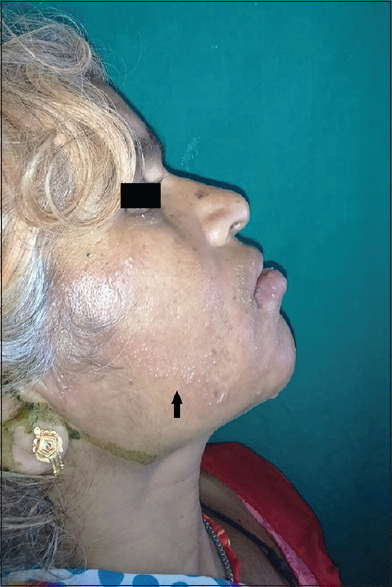 Here, we report a rare case of GS in a nonleukemic 62-year-old female who presented with generalized gingival enlargement involving both maxilla and mandible. Rhabdomyosarcoma is the malignant neoplasm of striated muscle and a relatively uncommon tumor of the oral cavity. Embryonal variety is the most common subtype, observed in children below 10 years of age but occasionally seen in adolescents and young adults. 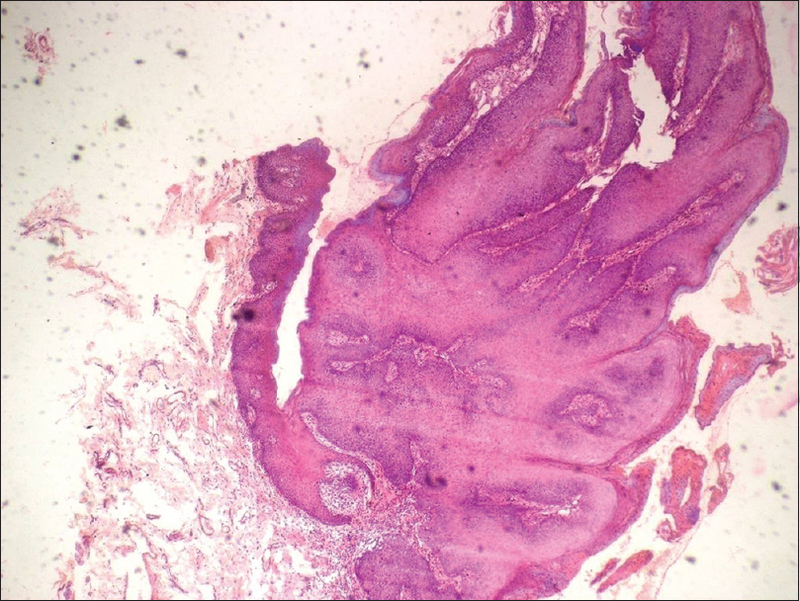 The present report describes a case of embryonal rhabdomyosarcoma in the left posterior buccal mucosa, with extension in the adjacent alveolus, soft palate, oropharynx and nasopharynx of a 17-year-old female. Solitary fibrous tumor (SFT) is a ubiquitous rare mesenchymal neoplasm. Pleura is the favored site of origin and is rare in the oral cavity. SFT occurs across a wide histopathologic spectrum. Fibrous form characterized by hyalinized, thick-walled vessels with opened lumina and strong CD34 reactivity constitute one end and on the other end, a cellular form representing the conventional hemangiopericytoma, with branched, thin-walled vessels and focal or negative CD34 reactivity characterize the spectrum. 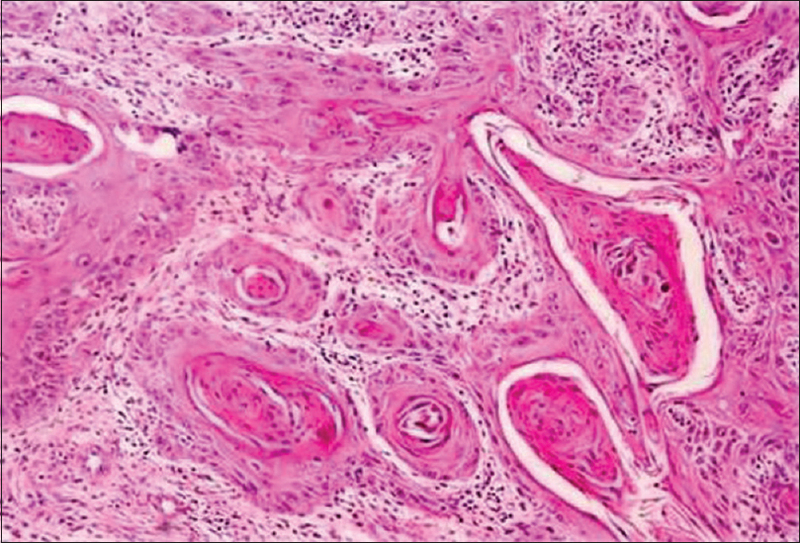 A case of oral SFT in a 30-year-old female patient with its clinical, histopathological and immunohistochemical features is being presented here. Objective: The aim of the study was to determine blood groups and Rhesus factor from dentin and pulp using absorption-elution (AE) technique in different time periods at 0, 3, 6, 9 and 12 months, respectively. Materials and Methods: A total of 150 cases, 30 patients each at 0, 3, 6, 9 and 12 months were included in the study. The samples consisted of males and females with age ranging 13-60 years. Patient's blood group was checked and was considered as "control." The dentin and pulp of extracted teeth were tested for the presence of ABO/Rh antigen, at respective time periods by AE technique. Statistical Analysis: Data were analyzed in proportion. For comparison, Chi-square test or Fisher's exact test was used for the small sample. Results: Blood group antigens of ABO and Rh factor were detected in dentin and pulp up to 12 months. For both ABO and Rh factor, dentin and pulp showed 100% sensitivity for the samples tested at 0 month and showed a gradual decrease in the sensitivity as time period increased. The sensitivity of pulp was better than dentin for both the blood grouping systems and ABO blood group antigens were better detected than Rh antigens. Conclusion: In dentin and pulp, the antigens of ABO and Rh factor were detected up to 12 months but showed a progressive decrease in the antigenicity as the time period increased. When compared the results obtained of dentin and pulp in ABO and Rh factor grouping showed similar results with no statistical significance. The sensitivity of ABO blood grouping was better than Rh factor blood grouping and showed a statistically significant result. Mesenchymal chondrosarcomas (MC) are rare and aggressive forms of chondrosarcoma. 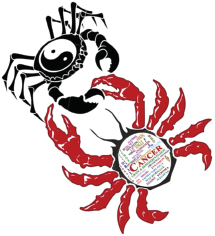 They are distinct tumors arising in unicentric or multicentric locations from both skeletal and extraskeletal tissues. The most affected region is the facial skeleton, especially the jaws. In this report, we present a case of MC primarily involving the mandible in a 60-year-old female patient. Basaloid squamous cell carcinoma (BSCC) is an aggressive, high-grade, variant of squamous cell carcinoma (SCC), which is uncommon in the oral cavity but slightly more common in the oropharynx. We present two cases of BSCC, one arising in the floor of the mouth and the other arising on the lateral border of the tongue. The diagnosis of this subtype of SCC is important owing to its particular behavior, with an aggressive course, a high incidence of local recurrence, regional lymph node metastases and mortality rate. Epidermoid cysts (ECs) are uncommon, benign cystic lesions derived from the entrapment of surface epithelium or more often from the aberrant healing of infundibular epithelium during an episode of follicular inflammation. ECs occur anywhere on the body, particularly along embryonic fusion lines, most commonly on the face, scalp, neck, chest and upper back. Head and neck ECs constitute only about 7%, whereas only 1.6% of ECs are reported in the oral cavity. They comprise <0.01% of all the oral cysts. Floor of the mouth, tongue, lips, palate, jaws, etc., are some of the reported sites of ECs in the oral cavity. Microscopically, ECs are lined with plain stratified squamous epithelium filled with laminated layers of keratin. Here, we report two rare cases of ECs, one occurring in the gingival aspect and other in the lower third of face. The cases are reported due to rarity of ECs in the head and neck region. Osteomyelitis is defined as inflammation of the medullary cavities, haversian system and adjacent cortex of bone. Osteomyelitis involving maxilla is quite rare when compared to that of mandible. Fungal osteomyelitis is very rarely seen and documented in the maxillofacial area. It is devastating to patients if it is invasive in nature. A prospective study was undertaken from December 2011 to December 2013. Biopsied hard tissue bits were decalcified and sections were stained with H&E, periodic acid Schiff and Grocott methenamine silver. Culture sensitivity was carried out in all cases. Surgical intervention followed by antifungal therapy was advocated to treat the patients. 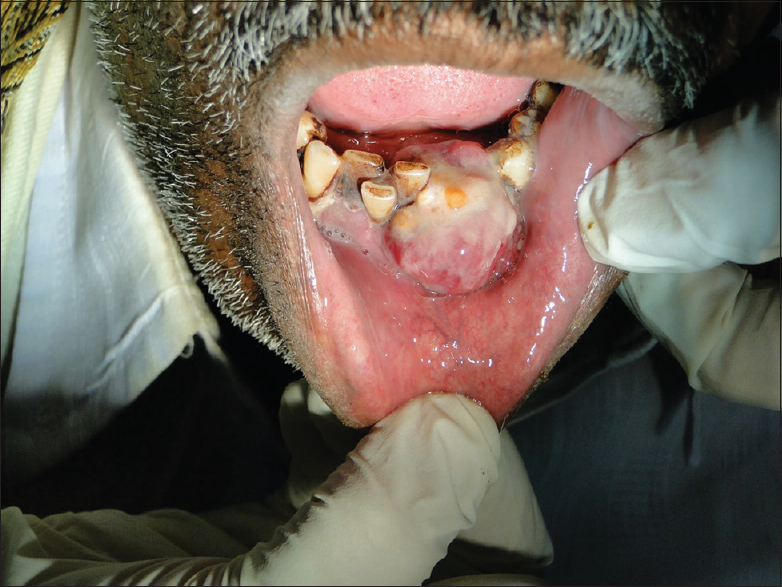 The current series showed five cases of fungal osteomyelitis which included candidal osteomyelitis, aspergillosis and mucormycosis with slight predominance of maxilla over mandible. Osteomyelitis of facial bones needs to be investigated thoroughly as there is no difference in clinical presentation between bacterial and fungal osteomyelitis. The diagnostic workup with biopsy and culture sensitivity helps to identify the pathogen at the earliest. Appropriate antifungal treatment needs to be advocated for successful treatment. Metastasis to the oral cavity is a rare occurrence with renal cell carcinoma (RCC) being the third most common tumor to metastasize to this location. Buccal mucosa is rarely involved and in the absence of a known primary, such lesions pose a diagnostic challenge to the pathologist. The histomorphological features may mimic a primary salivary gland neoplasm adding to the dilemma. We present one such case of metastatic RCC of the buccal mucosa. Herpes zoster or shingles is reactivation of the varicella zoster virus that had entered the cutaneous nerve endings during an earlier episode of chicken pox traveled to the dorsal root ganglia and remained in a latent form. This condition is characterized by occurrence of multiple, painful, unilateral vesicles and ulceration which shows a typical single dermatome involvement. 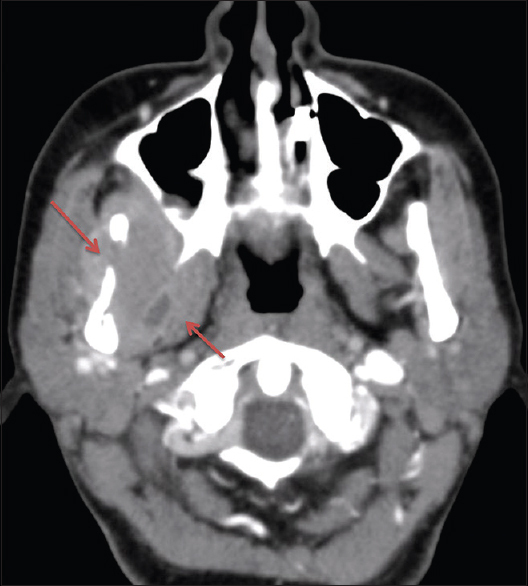 In this case report, we present a patient with herpes zoster involving the mandibular division of the trigeminal nerve, with unilateral vesicles over the right side of lower third of face along the trigeminal nerve tract, with intraoral involvement of buccal mucosa, labial mucosa and the tongue of the same side. Cytopathology revealed classic features of herpes infection including inclusion bodies, perinuclear halo and multinucleated cells. Adenosquamous carcinoma (ASC) of the head and neck (H and N) is an aggressive variant of squamous cell carcinoma (SCC). They are described as SCC subtype with high infiltrative capacity and also presents with dual histomorphology, having both squamous and glandular cell components. ASC of the H and N region is considered as a controversial tumor, as it is similar to salivary gland mucoepidermoid carcinoma. It has been described in a variety of body sites, including uterine cervix, lung and pancreas. ASC rarely develops in the upper aerodigestive tract, particularly in the oral cavity. The affected sites in oral cavity include palate, tonsillar pillar areas and floor of the mouth. To the best of our knowledge in the literature, only 17 cases of ASC in the floor of the mouth have been reported. 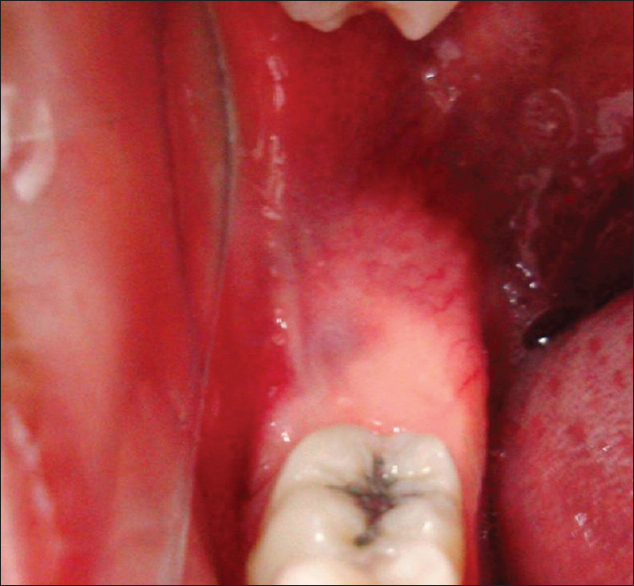 Hereby, we report an additional case of ASC occurring in the floor of the mouth in a 70-year-old male patient. The calcifying epithelial odontogenic tumor (CEOT), also known as the Pindborg tumor, is a benign locally invasive neoplasm. Common variants of CEOT include noncalcifying, Langerhans cell, bone and cementum forming and clear cell, which have a prognostic significance. Pigmented variants are known to occur in other odontogenic tumors. However, a definitive pigmented variant of CEOT has not been reported in literature so far. Here, we report the first case of pigmented Pindborg tumor arising from the maxilla in a young female. The pigment was demonstrated as melanin by staining and confirmed by immunohistochemistry. The pigmented variant of CEOT did not recur within 18 months postsurgery. Our report indicates that it is essential to recognize the pigmented variant. We discuss the common variants of CEOT and potential histogenesis of the pigmented variant. 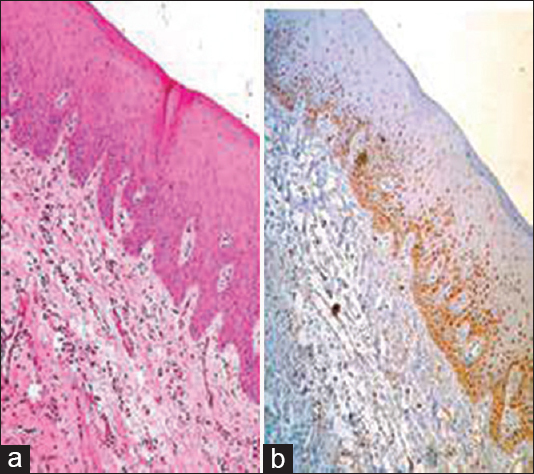 Further studies are required to reveal the histogenesis of melanocytes and their pathological significance in the odontogenic tumors. Pemphigus vulgaris (PV) is a chronic, autoimmune, intraepidermal blistering disease of the skin and mucous membranes. The initial clinical manifestation is frequently the development of intraoral lesions, and later, the lesions involve the other mucous membranes and skin. The etiology of this disease still remains obscure although the presence of autoantibodies is consistent with an autoimmune disease. These antibodies are targeted against the adhesion proteins of keratinocytes, leading to acantholysis (disruption of spinous layer, leading to intraepidermal clefting) and blister formation. Because only oral lesions are present initially, the chances of misdiagnosing the disease as another condition are increased, leading to inappropriate therapy. 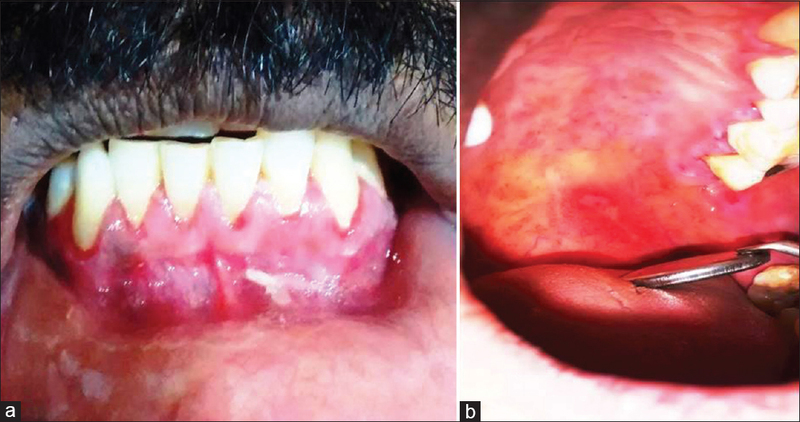 In this article, we report a case of PV with only oral manifestations in a 36-year-old male.